At the very top of the house, the roof line does look like a dinosaur’s back. 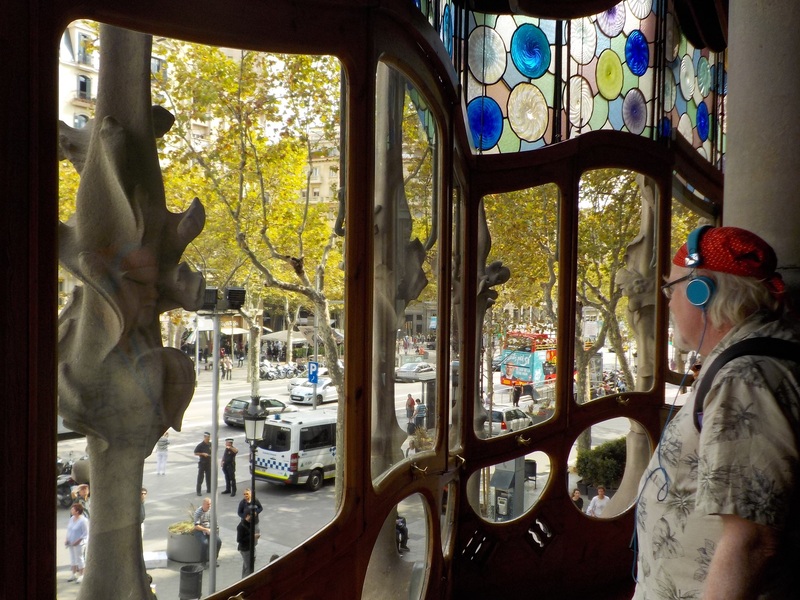 The inside was highly decorative and cleverly engineered to promote circulation of air through all six stories, via a central air well and adjustable vents. 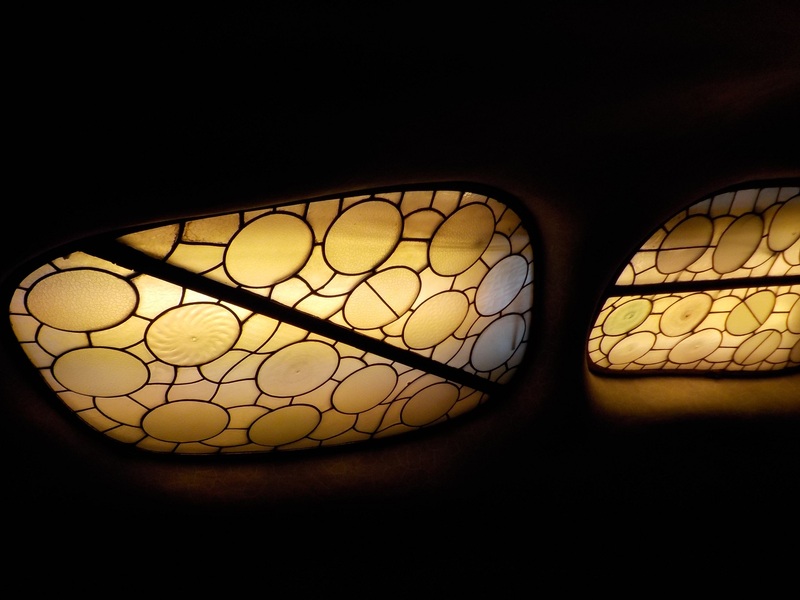 The air well was a work of art, tiled to reflect more light in the lower levels and less light where it was brightest at the top. Up close the blue becomes lighter and lighter as you descend from the roof (L-R). 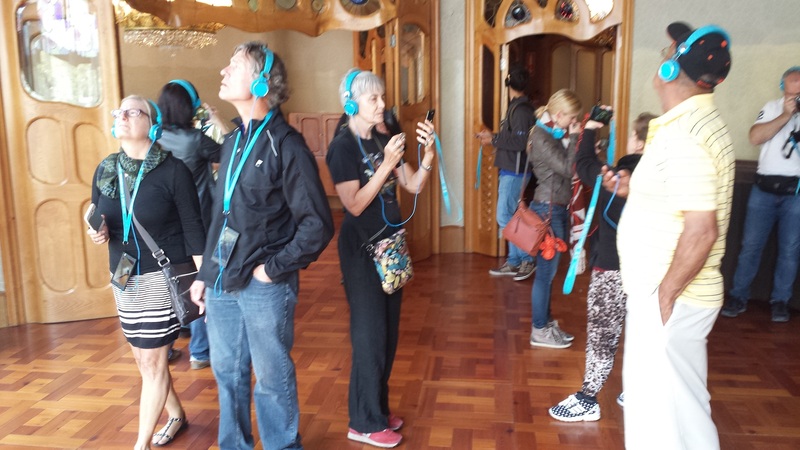 Notice that we are all wearing headphones and holding smartphones. In each room, in addition to an audio presentation there is a virtual reality program that shows you the room with its furnishings. If you point your phone toward one wall or corner of the room, it shows you that area. As you rotate the screen around the room you see the rest of the room with its period furnishings. 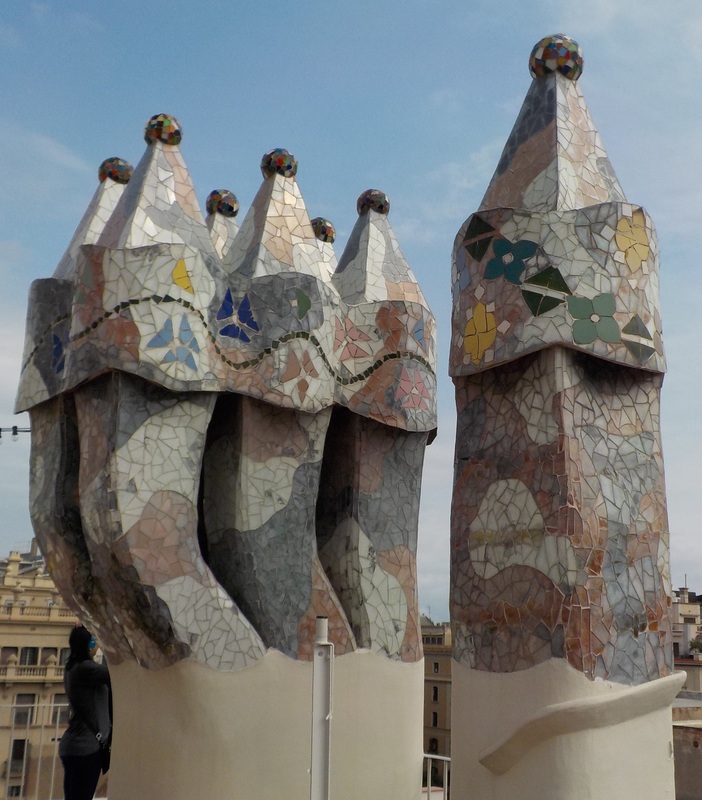 Many of the original pieces can be seen at museums in Barcelona like the Museum of Art of Catalonia and the Museum of Catalonian Modenism. 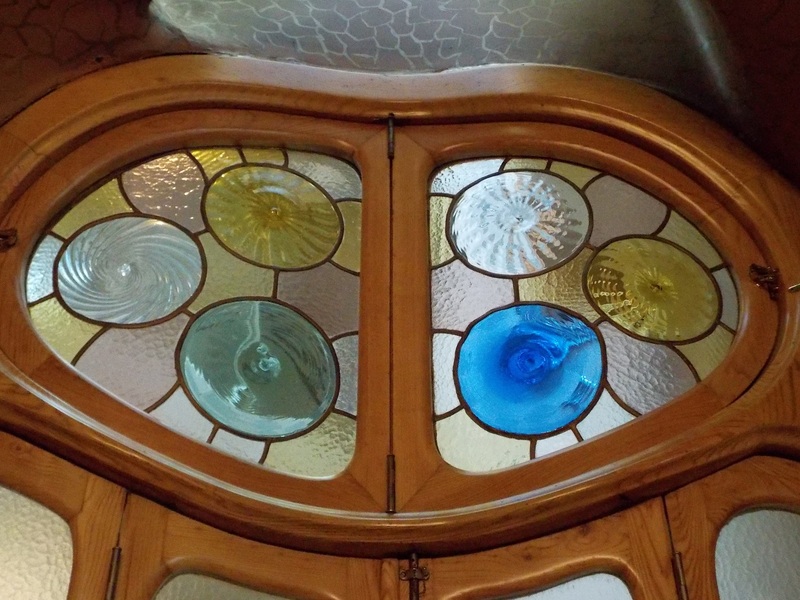 I wondered why there were so many pieces from the Casa Batlló in museums when the house was open for visitors. In the virtual rooms the floors are covered with large persian rugs and the wooden chairs, end tables, armoires, etc. 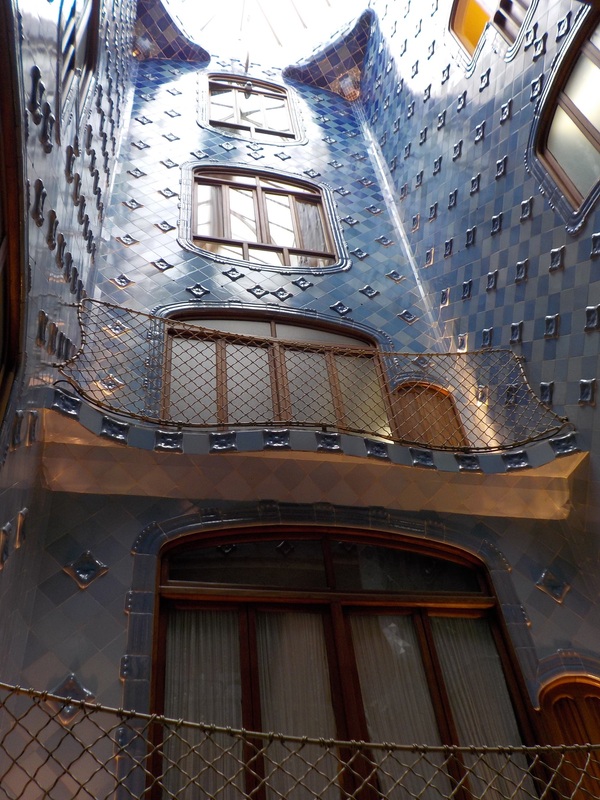 that Gaudi designed specifically for the house, are all positioned around the rooms. 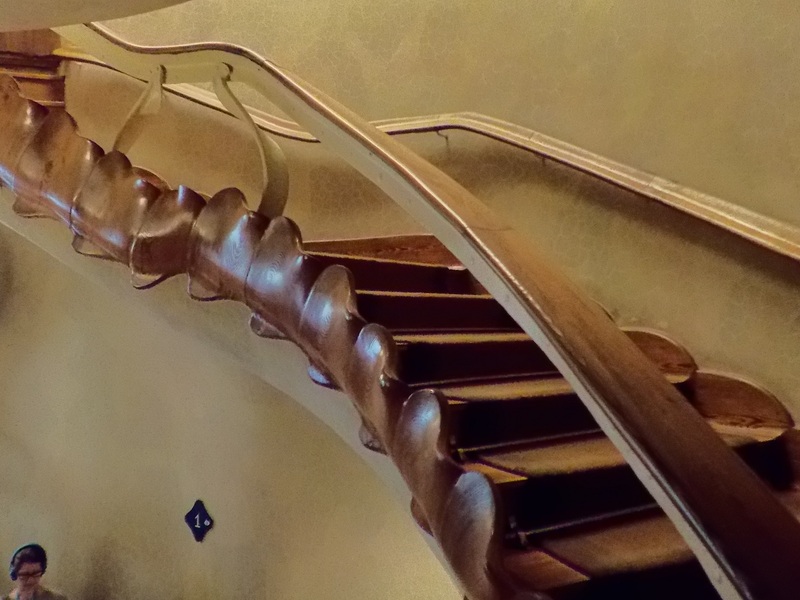 This is from staging and photographing the rooms, not taken from historic photos, so the scenes don’t have the lived-in quality that photos provide, but they also show the objects to best advantage. There is a historic photo of an elaborate settee that has chairs in front of it, the settee unused. No wonder they didn’t do a virtual reality of that arrangement. 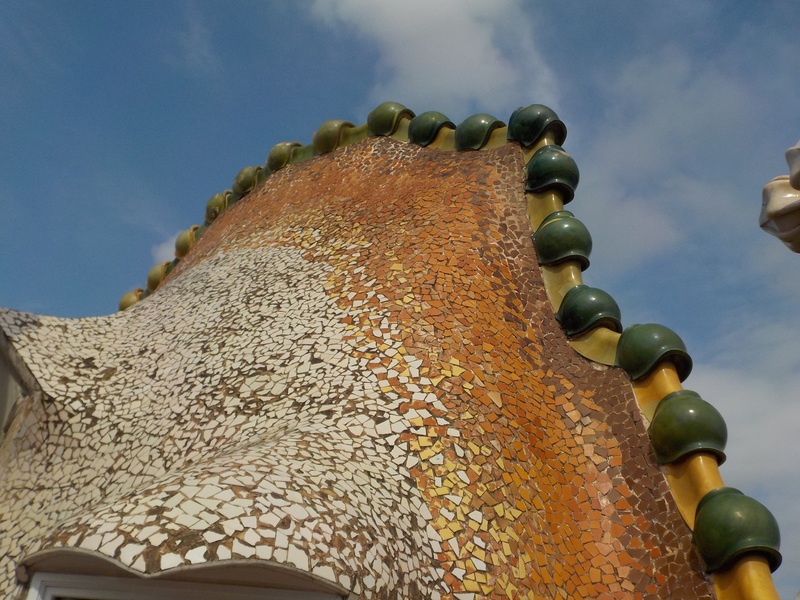 Like other Gaudi houses, the roof is a fantasia of tiled chimneys, the skylight over the air well and the dinosaur back of the facade. From the roof it is easy to look onto the terrace of the adjacent house, Casa Amatller, another Moderniste design by one of Gaudi’s contemporaries, Josep Puig i Cadafalch. I wonder what the homeowners thought of one another with their competing monuments to bourgeois success side by side on a main thoroughfare. Is there a hint in the fact this was called the “Manzana de la Discordia (the block of discord).” Was it the discordant architectural styles, or friction among the owners? Guidebooks aren’t saying.